JOHOR BARU - Johor's Crown Prince Tunku Ismail Sultan Ibrahim has thanked the Singapore Government for helping the Malaysian state during drought seasons. Calling Singapore "a neighbour and a friend", Tunku Ismail said in a tweet on his official JohorSouthernTigers account on Thursday (June 28): "Thank you to the Singaporean Government for helping Johor during the drought seasons & when we had our water crisis. We have always helped each other. May the close ties & friendship forged hundreds of years ago last forever." His tweet came as the Malaysian government said it planned to renegotiate the 1962 water supply deal with Singapore. Prime Minister Mahathir Mohamad has in recent interviews criticised the deal as "too costly", and said that Malaysia will approach Singapore to renegotiatie the terms of the deal. Singapore's Ministry of Foreign Affairs said the 1962 treaty was guaranteed by both governments in the Separation Agreement, which was registered with the United Nations when Singapore broke away from Malaysia in 1965 and that both sides must comply fully with all the provisions of these agreements. In 2016, Singapore's national water agency Public Utilities Board (PUB) supplied additional potable water to Johor after water levels in the southern state's dam hit all-time low levels due to the dry weather. Over the years, PUB has - at Johor's request - supplied about 16 million gallons of potable water per day to Johor. During the drought season in 2016, PUB increased Singapore's supply of treated water to Johor to 22 million gallons daily. Besides the water deal, the new Malaysian government has also said it would review the multi-billion dollar Singapore-Kuala Lumpur High-Speed Rail project. Dr Mahathir has said Malaysia needs to scrap big budget projects so that it can reduce its US$250 billion national debt. In an interview with The Straits Times on Thursday (June 28), Malaysia's Defence Minister Mohamad Sabu said he is confident that the two sides can resolve these bilateral issues. He said that relations between Malaysia and Singapore go through periodic problems, but the two neighbours are adept at resolving them. "Singapore is our most important neighbour. There will always be problems, it is normal, even married couples have problems, but they can be resolved," Mr Mohamad said. 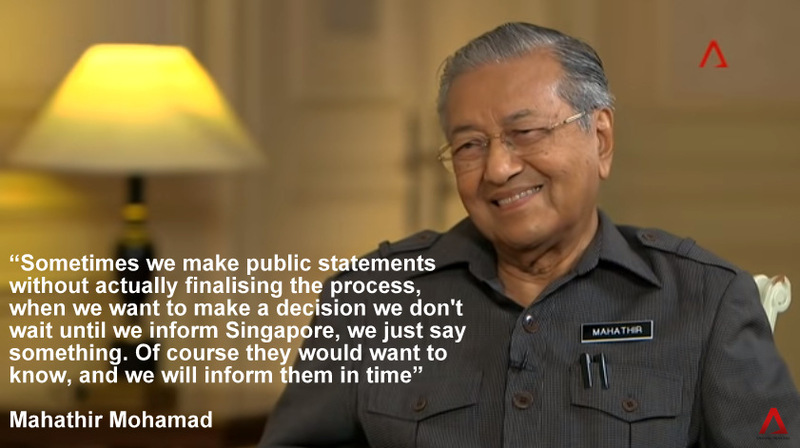 "So far, there is no problem that cannot be resolved between Malaysia and Singapore. We are good neighbours." Social media users mostly welcomed Tunku Ismail's comments, which were also posted on his official Facebook page. Facebook user Vicknesh Rajamohan said: "Class act Your Highness. A true inspiration of how a leader should conduct (himself). Wisdom is not in age but in actions, and you have shown your wisdom." Netizen Nasrulhadi Noh posted: "Many forget that during the July 2016 drought, Singapore supplied an additional 6 million gallons of water a day to Johor. That is what neighbours are for." Some, however, asked why Johor could supply water to Singapore, but could not collect and treat enough water for its own citizens, who undergo intermittent water rationing in towns like Muar. A Mohd Nizam wrote: "Johor sells water to SG... SG citizens never had problems with water (supply). But the country where the water comes from has water problems everywhere." Others said the Prince's praise for Singapore was actually an indirect attack on Tun Dr Mahathir for wanting to renegotiate the water deal. Wrote Azhar Latif: "TMJ (Crown Prince)'s statement has a deeper meaning that will redden the ears of Tun (Mahathir)." JOHOR BARU • Johor's Menteri Besar Osman Sapian said the state hopes that it can raise the price of the raw water that it sells to Singapore after discussions with its southern neighbour. The price could well be raised from the current 3 Malaysian sen (1.01 Singapore cent) per 1,000 gallons to the same level that water is sold to Johor's northern neighbour Melaka - at 50 sen per 1,000 gallons, he told a news conference yesterday. "It is about time that we raise it. Maybe we will increase it to the price of raw water that we sell to Melaka," the Astro Awani news site reported him as saying. "Or maybe with further discussion, the price that will be sold to Singapore will be less than the price sold to Melaka, but it will not be at the current price that Singapore buys it now." Datuk Osman said that he discussed the issue with Prime Minister Mahathir Mohamad last week, the news site of the private TV channel said. Mr Osman said Malaysia will study the water agreement with Singapore to see whether the price could be reviewed. "This needs further discussion. I feel that if the Johor government were to raise it to a reasonable rate, Singapore will accept it because that is our hope," he added. Tun Dr Mahathir had, in recent interviews, criticised the 1962 water deal as "too costly" and "ridiculous", and said Malaysia would approach Singapore to renegotiate the terms of the deal. Dr Mahathir said last month: "We are studying the case properly and we will make a presentation", but he said the issue is "not urgent". Singapore's Ministry of Foreign Affairs said the 1962 treaty was guaranteed by both governments in the Separation Agreement, which was registered with the United Nations when Singapore broke away from Malaysia in 1965. Singapore says both sides must comply fully with all the provisions of these agreements. The water agreement, which expires in 2061, entitles Singapore to draw up to 250 million gallons a day (mgd) of raw water from the Johor River. In return, Johor is entitled to a daily supply of treated water of up to 2 per cent, or 5 mgd, of the water supplied to Singapore. Malaysia will honour the water agreement with Singapore while seeking to restart negotiations on pricing, said Foreign Minister Saifuddin Abdullah, who described discussions over the Kuala Lumpur-Singapore High-Speed Rail (HSR) as the "immediate and urgent" concern between the two neighbours. Datuk Saifuddin, who is due to visit Singapore next week for a meeting of Asean foreign ministers, waved away concerns about "turning off the taps", saying such a move "is definitely not in our mind". "Water is like our nerve system. We honour our nearest neighbour. Malaysia and Singapore have always enjoyed that special relationship. The idea is how we go about to continue from where we have stopped in the negotiation," he told The Straits Times in an exclusive interview yesterday. Mr Saifuddin said "water is a long story" with "nothing concrete decided" except that "we will continue talking to" Singapore. "What is immediate and urgent is to resolve the HSR story," he said, adding that Malaysia has agreed to a "proper discussion" by next Tuesday. "We understand certain parts of the agreement will confine us to more or less agreeing to continue but again, these are things that we want to negotiate. I believe that our Singapore counterpart will understand some of the difficulties the new government is faced with as far as this project is concerned." Soon after winning the May 9 election, the Pakatan Harapan (PH) government had said it wanted to review the 350km rail project agreed to by the ousted Najib Razak administration, as well as to renegotiate the terms of the 1962 water deal. Both pacts are legally binding international agreements. Kuala Lumpur said it could not afford the RM110 billion (S$37 billion) projected cost for the HSR, after discovering it had more than RM1 trillion in liabilities. But due to cancellation penalties in the pact, it would have to discuss options with Singapore, including a deferment. Economic Affairs Minister Azmin Ali will lead negotiations on the HSR, and has said he will try to hold talks by the end of the month. The water agreement, which expires in 2061, sees Singapore drawing up to 250 million gallons a day (mgd) of raw water from the Johor River, and Johor entitled to 5mgd of treated water from Singapore. 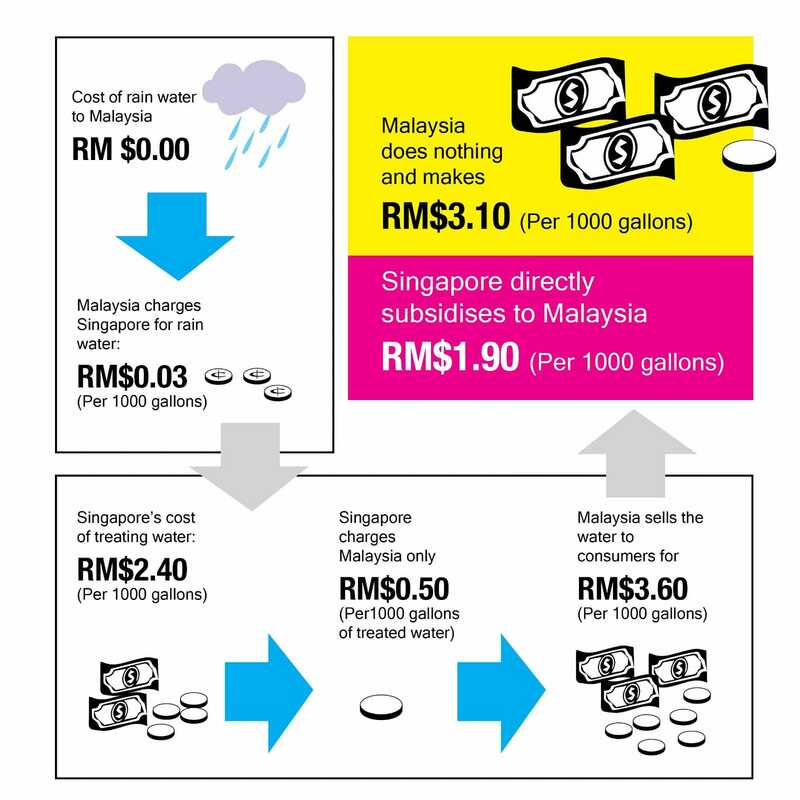 Singapore pays 3 sen (1 Singapore cent) per thousand gallons of raw water, and sells treated water back to Johor at 50 sen per thousand gallons. 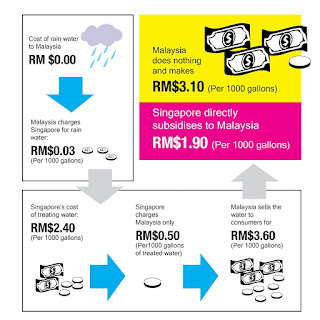 Singapore has said this price is heavily subsidised and below the cost of treating the water. Malaysia chose not to review the price when allowed to in 1987, but talks took place when then Prime Minister Mahathir Mohamad raised the issue in 1998. The talks did not result in a new pact. Mr Saifuddin, who is PH chief secretary, also said Malaysia could learn from Singapore in maintaining religious harmony. "I think they have done a good job," he said. "We have our issues, they have their issues, but to a certain extent, they have done quite well and we can emulate, if not all, at least the spirit behind the experience that they have gone through." Singapore has been clear and consistent in its position that Malaysia lost its right to review the price of water under the 1962 Water Agreement in 1987, Singapore's Ministry of Foreign Affairs (MFA) said yesterday. The statement, on the second and final day of Malaysian Foreign Minister Saifuddin Abdullah's introductory visit, comes as Malaysia's national news agency Bernama cited the minister as saying in an interview that "the agreement says the content of the agreement can be reviewed after 25 years". "It doesn't mean at 25 years... so we can continue talking," Bernama reported Datuk Saifuddin as saying in the Monday interview. The MFA said Singapore's position was most recently set out in Foreign Minister Vivian Balakrishnan's remarks in Parliament on July 9. Dr Balakrishnan had told the House that Malaysian leaders had previously acknowledged that they chose not to ask for a review in 1987 because they benefited from the pricing arrangement under the agreement: Johor buys treated water from Singapore at 50 Malaysian sen per 1,000 gallons, which is a fraction of the true cost of treating the water. Dr Balakrishnan had added that in 2002, then Prime Minister Mahathir Mohamad said Malaysia did not ask for a review when it was due as it knew that any revision would also affect the price of treated water sold by Singapore to Malaysia. The issue of water was among the issues discussed during the visit of Mr Saifuddin, who called on President Halimah Yacob and Prime Minister Lee Hsien Loong on Monday, and on Deputy Prime Minister and Coordinating Minister for National Security Teo Chee Hean yesterday. Mr Saifuddin also had a meeting with Dr Balakrishnan on Monday, followed by lunch. "During the visit, both sides reaffirmed our commitment to work closely together to build on our strong bilateral relations for mutual benefit," the MFA said. "Discussions covered a range of regional developments and bilateral issues, including the KL-Singapore High Speed Rail (HSR) and the 1962 Water Agreement," it added. "Singapore's leaders emphasised the importance of abiding strictly by the agreements and contracts related to these matters, while exploring potential new areas of collaboration," the MFA said. Tun Dr Mahathir, who became Malaysian Prime Minister again in May, has sought to defer the HSR project and renegotiate the water pact, both of which are legally binding agreements. In his interview with Bernama, Mr Saifuddin said bilateral relations are at a very good level, and both governments saw the HSR project and the water agreement as issues that need to be tackled, but that should not be obstacles to maintaining good relations. Mr Saifuddin added: "I tried my level best to explain the situation. We are looking at the big picture. As far as our bilateral relations (are concerned)... our ties are strong and we want to work hard to take them to greater heights." He also said he had informed the Singapore leaders that on July 23, Economic Affairs Minister Azmin Ali had written to his Singapore counterpart, saying he will be travelling to Singapore to discuss the HSR project. "It will take place very soon," said Mr Saifuddin, adding that Datuk Seri Azmin had "stated the fact that we want to sit down and discuss". On the 1962 water pact, Mr Saifuddin said there were discussions in the past, but there had been no progress then. "Surely we can continue the discussion," he told Bernama.